No meat here. Mainly fruit and veg. Not much to make whole meals, pasta, rice etc. This person really likes their numbers but ironically is not a fan of plurals. 4 grapefruit, 2 big yoghurt etc. A decent list on traditional paper representing a rounded, 5 a day, diet. 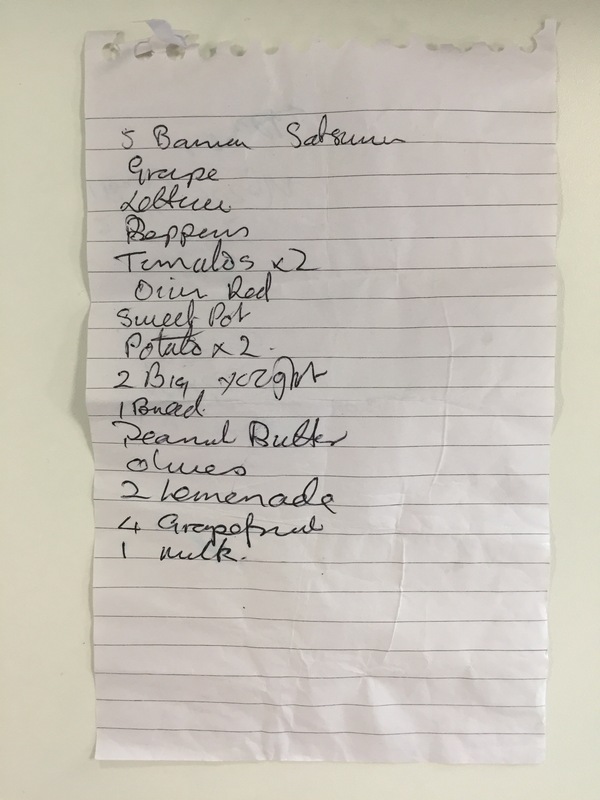 Small banana, small satsuma, grape, lettuce, peppers, tomatoes x 2, onions red, sweet potatoes, potato x 2, 2 big yoghurt, 1 bread, peanut butter, olives, two lemonade, 4 grapefruit, 1 milk. Kindly found and supplied by Andy.